The major winter storm that moved through Arizona on Thursday continues to drop snow and rain on the state Friday. 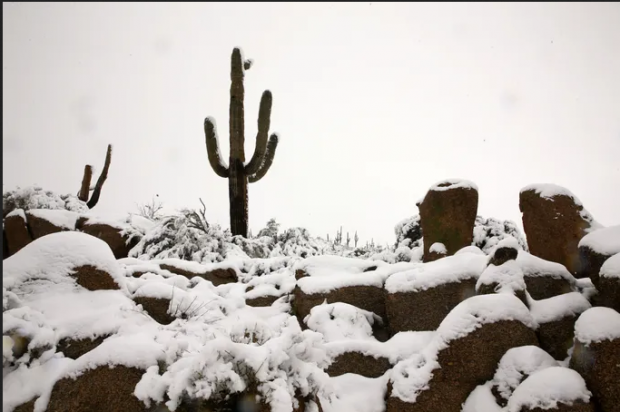 The forecast called for snow to continue into early Friday afternoon in parts of Arizona's higher elevations, including parts of eastern Arizona, while rain was expected to continue on and off into Friday afternoon in the Phoenix area. On Thursday, Flagstaff shattered a record that had stood since 1915 for the most snowfall in one day, recording more than 31 inches. Numerous other communities in Arizona's high country recorded heavy amounts of snow exceeding 20 inches. The Phoenix area was drenched with rain throughout most of Thursday. According to a tweet from the city of Scottsdale, trash and recycling pickup will not occur in the area north and south of Happy Valley Road and east of Pima Road because of the snow. The areas missed will get service on Saturday. Snow is falling in Tucson near Interstate 19 and Ajo Way, the Arizona Department of Transportation tweeted Friday morning. Snow was also reported on Interstate 10 between Benson and Tucson, causing slow traffic, ADOT reported. The National Weather Service in Tucson tweeted the area is facing "widespread rain and snow" with snow levels as low as 2,000 feet. That includes all of metro Tucson, the Weather Service said. On cold surfaces, 1 to 2 inches of snow is possible. The following street closures remain in effect Friday morning due to flooding from the winter storm, according to the city of Phoenix. -48th Street, from Hoh Way to Warner Road, was closed at 9 p.m. Thursday. -Seventh Avenue, from Coral Gables Drive to Greenway Parkway was closed at 2:40 p.m. Thursday. -Deer Valley Road at Seventh Street was closed at 8:03 p.m. Thursday. City officials advise motorists to find alternate routes and not cross flooded streets, the city tweeted shortly after 7 a.m. Friday.